On Friday, my wife and I welcomed the newest member of the Concealed Carry Academy family. Although, unlike my other employees, this one won’t prove useful for a number of years and will probably end up costing me a small fortune… Her name is Scarlet and she weighed 8 pounds, 4 ounces. And now that I’ve got my first child at home I thought it would be appropriate today to cover the topic of how I lock up all of my guns. I have a lot of guns in my house and I utilize a variety of safes and “gadgets” to keep them secure. 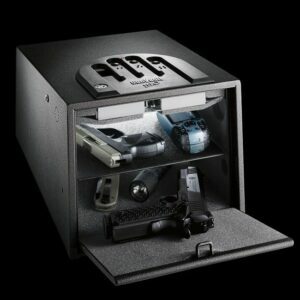 The two most common safes in my house are the Gun Vault and the Stack-On PDS 500. Both of these safes are fast opening, allowing the gun to be accessed in 3 seconds or less. Personally, I have guns stored on every level of my house and thus, one of these safes is on each level so that I can quickly access a gun if need be. Also, both of these safes require me to punch in buttons to open them and they don’t use any biometric/fingerprint scanning. The biometric technology in most safes is not good enough yet and you don’t want to be killed by an intruder because you swiped your finger 15 times and the safe still wouldn’t open. For my long guns – shotguns and rifles – I do a few different things. These are obviously not a good idea, especially if you have kids around because they only hide guns, they don’t safely secure them. One other thing I want to quickly cover is what I discussed last week. When I’m in my house I’ll often carry my Ruger LCP or a S&W snubby in my pocket. When carrying these guns I’m always mindful of where the gun is pointing to make sure I’m not muzzling anyone. And if I ever take off my pants to shower or change, then the gun obviously goes right into a safe and not on the ground still in the pocket of the pants. And don’t forget, even if you don’t have young kids you probably still have friends, family members, plumbers, electricians, the cleaning lady, and other people walking through your house. So lock up those guns so nobody can access them, except you and your spouse.